To refer to Valentina as an accomplished martial artist is quite the understatement. She began her training in martial arts at only 5 years old under her lifelong coach, Pavel Fedotov, and her entire family is composed of martial artists. Her older sister, Antonina, is a 10 time World Champion in Muay Thai. Her mother is a 3rd degree Black Belt in Taekwondo, and President of the Kyrgyzstan Muay Thai Federation. Throughout her martial arts career, Valentina has earned 17 World Champion titles in various martial arts, including Muay Thai, K-1, and Mixed Martial Arts. Out of her 58 professional Muay Thai fights, she has won 57. Valentina recognizes the practice of shooting firearms as a martial art, and treats it with the same honor and reverence as fight-based disciplines. She and Antonina began their firearms training with Fedotov around 2006, and have been competing since 2010. Although the bulk of her time is spent focusing on her budding MMA career, Valentina never misses an opportunity to shoot, and relishes the occasions when she can try out a new gun. For Valentina and her family, shooting is a cherished pastime, a chance to bond over the enjoyable – but focused – art of the gun. In her native Kyrgyzstan, the culture of firearms is far more meaningful than simple recreation or defensive use. According to Valentina, “A firearm, it is a cult. It is a symbol”. A firearm can hold the same historical legacy as a castle. It is often a family jewel which is inherited after generations of being carefully stored by descendants. Firearms are taken out during special occasions to show to dear friends and guests, and tell the stories of the generations before us. Valentina refers nostalgically to the happiness which fills a child when a parent allows her to touch a real pistol or shotgun for the first time. In many ways, they are valuable tools for teaching children responsibility and respect for themselves, and for others. Firearms are not only a form of enjoyment and family recreation, however. Valentina believes they should be viewed as an indissoluble part of humanity. As long as humans exist in the world, she posits, so will firearms. Her unique views on the influence of firearms on culture and tradition reflect in her love for competitive shooting. 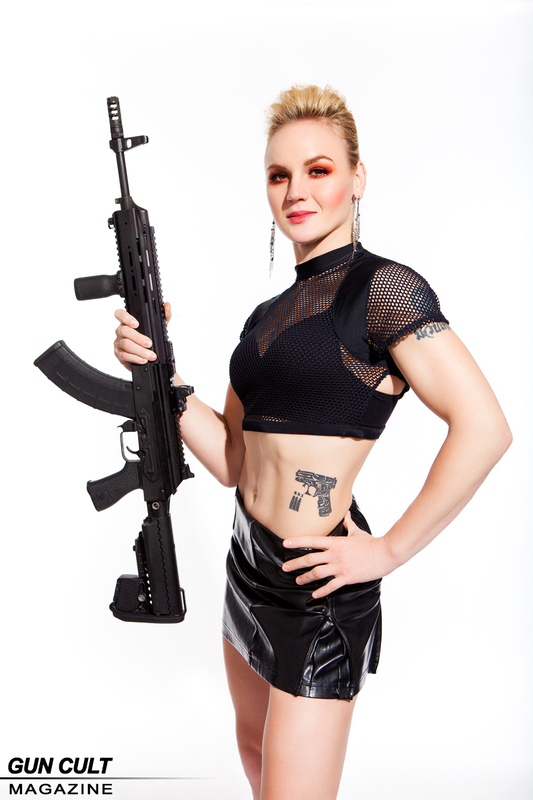 As a regular competitor in IPSC, IDPA, and 3-Gun, Valentina acknowledges that shooting is very similar to MMA in terms of training and discipline. Shooting is not just about precision to Valentina, as speed and knowing how to resolve any problems with the gun mid-run are equally important components of the sport. She admits to tiring more easily in shooting training than in MMA, and believes that shooting also requires more discipline. After all, there is no defense or counter-attack for a mistake made on the range! No one understands this important safety principle better than Valentina, who is all business while at the range. “I know exactly when you have a gun in your hand, it is no time for jokes. I concentrate on what I am doing and leave all smiles behind.” As her fighting adventures lead her to MMA competitions across the globe, she frequently seeks out competition shooting matches in new countries. Valentina notes that although there are a lot of differences in language and rules for matches around the world, everyone shows the same love and respect for firearms. “It’s the nicest thing,” she says with adoration. Valentina frequently practices her shooting with coach Fedotov at The Arms Room, a gun range in Houston, Texas. Also an avid shooter, Fedotov carries a concealed handgun for self-defense. In July of 2016, the unthinkable happened as she and Fedotov were eating at a restaurant in Lima, Peru. Robbers rushed into the restaurant and Fedotov jumped into action with his own handgun, igniting a shootout in which he was shot in the abdomen. While the wound could have easily proved fatal, Fedotov was rushed to the hospital and survived. Valentina had been in the process of preparing for the biggest fight of her career against former UFC woman’s bantamweight champion Holly Holm, and despite being unable to train for a week afterward due to the stress of the situation, she refused to quit. While Fedotov recovered in the hospital, he continued to coach Valentina, and encouraged her to not drop out of the fight. Valentina speaks of the incident as a very traumatic ordeal, and one that could have given her an easy excuse to pull out. Instead, she shifted her mindset and used the training for her upcoming fight as a way to put the trauma behind her and focus on the task at hand. Being involved in a real-life shooting did not phase or deter Valentina from her love of the sport. Her social media feeds are continuously awash with pictures and videos of her shooting adventures meshed in between MMA training, beautiful shots of nature, and stunning photos of her looking gorgeous in everyday life. While she enjoys shooting all types of guns indiscriminately, pistol is her favorite. She shoots a Glock in competition, while her sister Antonina prefers the metal-framed CZ-75. Her arsenal includes a Glock 17, a Glock 22, several Russian-made pistols such as Makarov and Tokarev, a Nagant revolver, and a Sig Sauer Scorpion 1911. Valentina collects firearms like a connoisseur, trains with them like a martial artist, and shoots like a true champion. Because, well - she is one. Follow Valentina on Instagram, Twitter or Facebook. Be sure to check out Muay Thai Sisters, the Shevchenko sister's YouTube page. Photos by Rudy Arocha Photography. Gun courtesy BSG Security Services.